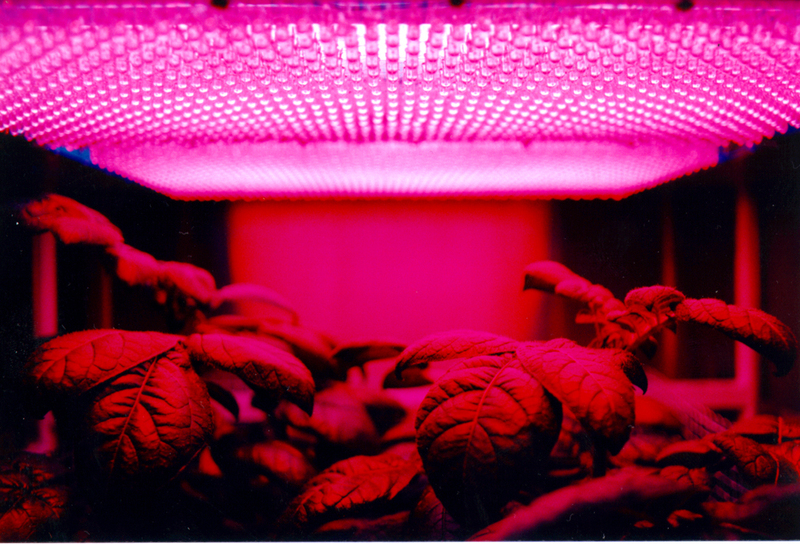 The development of small food-growing systems using LED lights and shipping containers has made it possible to get fresh greens in the Arctic affordably and at any time of the year. When customers in Unalaska go to Alaska Ship Supply to stock up on groceries these days, they are confronted with choices that seemed impossible just last summer — locally grown heads of butterhead lettuce and romaine lettuce, along with an assortment of kale, cilantro, basil and arugula. On a late winter day, the produce aisle features green leafy foods fresh from a local farm, not wilted specimens weeks removed from fields thousands of miles away. That this change has taken place on the windswept Aleutian island about 800 miles southwest of Anchorage is testament to a sea change — and fresh evidence that local agriculture has started to move from potential to practical. Never before has there been local supply of produce in Unalaska and the community no longer has to import the raw material for salads, said Blaine Shaishnikoff, co-owner of Aleutian Greens. Their farm is sheltered from the Aleutian winds and heavy rain, confined as it is within the walls of two 40-foot shipping containers where plants lit by LEDs burst with the greens of summer, regardless of the temperature outside. Each container is capable of producing 450 heads of lettuce a week and a variety of other greens, plants growing hydroponically in a nutrient-rich solution, not in soil. The plants are suspended, while the roots grow into the solution below. Shaishnikoff and his wife, Catina, began supplying local restaurants in the fall and had their produce on store shelves by January. The controlled conditions allow plants to reach maturity faster — as short as six weeks in some cases. The boxed farmstead approach to produce couldn’t be more different than the systems that developed over the decades in Alaska and northern Canada through air, land and sea transportation, importing perishable items in every season. The complex supply chain required to deliver a head of lettuce from a field in California to a remote community in the far north is an impressive feat of technology. But it’s also expensive, vulnerable to disruption from weather or logistical problems and it does nothing to promote local sustainability and healthy food. Every day away from the field means a reduction in quality and a greater chance that in the end the customer in Kotzebue, Alaska or Churchill, Manitoba will pay a high price for a poor product. The containers housing the farm of Aleutian Greens came from Spokane, Wash., the product of an Anchorage company that seeks to bring smart farming solutions to the table. The three founders of VH Hydroponics believe that one solution for Arctic communities is to use new technologies to grow high-quality produce close to home. The Anchorage company is working on the fourth generation of what they call a “farm in a box,” a windowless insulated steel container designed as a portable home for hydroponic growing. Several of the containers have been transported to remote parts of Alaska and northern Canada. “Everything about this is built for the Arctic,” said Linda James, who along with Daniel Perpich and Cameron Willingham founded the company with a vision to develop year-round local agriculture. It was seeing a head of old lettuce selling for $18 during a trip to Resolute Bay, Nunavut in 2011 that planted the idea that there must be a better way. They founded their company in 2014 and see their work as a contribution to improving the lives and health of people across the north. Developing local economies and changing attitudes about food security are also of prime importance, James said. It’s an ambitious vision, but they’ve made great strides in the past few years and have found partners like Shaishnikoff who have already shown it can be done. James said that the ingredients for a successful operation include a strong local commitment from people who take it on as a personal challenge, not as a side project. That’s happened in Unalaska, she said. “Any time that you have a place that geographically isolated and you are far away from the point of production, that’s where this can work,” said James, an Army veteran and chief operating officer of VH Hydroponics. She said that with the reliance on air transportation, almost all of the money paid by consumers goes for shipping and handling, not for the product. “If utility costs are extremely high in comparison to the price of the product, it’s a challenge. But generally speaking in rural Alaska and northern Canada, it pencils out well,” she said. Pat Holloway, a horticultural consultant and retired University of Alaska Fairbanks professor, said she is impressed with the way the company has refined its garden containers, which can be flown into remote sites and villages on a Hercules C-130. “All along the coast it’s a major challenge to grow anything,” she said. James said that in addition to the large commercial containers, the company is developing smaller units that could be used for restaurants, schools, senior centers and other places with demand for fresh food.